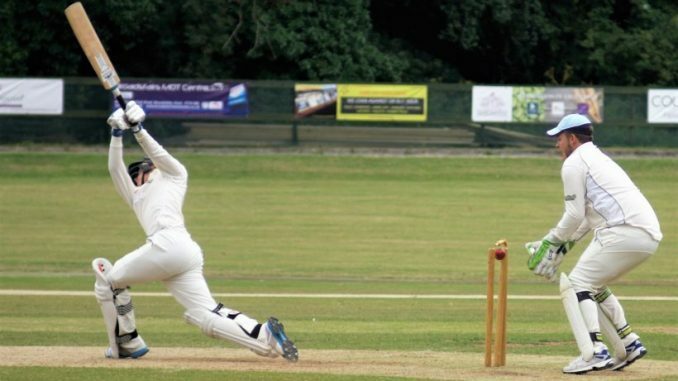 When Broadstairs won the toss and elected to bat, they didn’t expect to be two wickets down within the first 4 overs but that was the situation they found themselves in after the early loss of opener Chris Flint (0) and Swaroop Dasari (12). As the lunchtime sunshine turned to drizzle, it was looking like Broadstairs might be in for another tough afternoon. However, a third wicket partnership of 76 between opener Elliot Fox and Isaac Dilkes steadied the ship and when Fox was finally dismissed for 46 just before drinks, the score stood at 93-2 with plenty for the middle order to build upon. This they did with relish, with Jack Wheeler putting on a barnstorming show of boundary-hitting, amassing a total of 71 in 48 balls including 9 fours and 3 sixes. The partnership between Wheeler and Dilkes (57) was worth 110 and meant that subsequent batsmen could come in for the remaining 10 overs in the knowledge that Broadstairs had probably already posted a winning score. Scott Narraway capitalised on this situation, scoring his second half-century of the season, finishing-up 57 not out off 34 balls and hitting 4 sixes in the process. The remaining tail-enders all chipped-in with quick scores and once the tea-time rain had eased-off, Broadstairs looked forward to an afternoon in the field, defending a huge score of 298. The Sibton Park innings immediately ran into trouble with Hickmott dismissed by Flint in the first over. Although the visitors did offer some resistance, the target was always going to be beyond their reach and wickets were shared around the bowlers with Dasari (3-26) and Callum Morgan (2-19) leading the way. Eventually, Sibton Park managed to see out their allotted 50 overs with just one wicket remaining and a total of 201, nearly 100 runs short of the host’s total. This first victory in 3 matches brings Broadstairs back into promotion contention, just 9 points behind the leaders St Lawrence and Highland Court. The match demonstrated how important it is for Broadstairs’ top order batsmen to establish a platform in the first 20 overs, enabling the very long middle-order to score with freedom. They will be hoping to take this good form into the next match which will be away to fellow promotion hopefuls Chestfield.